…was the inspiration for the current CCC challenge. First, I thought that I had to do a Bruce Springsteen Scrapbook mini page which would have been awesome fun, but then I decided to go with the rules and create a card. The second thought was to use a treble clefs, as you can see in the background. I created it with a sponge dauber in bermuda bay (WHAT a COLOR!). 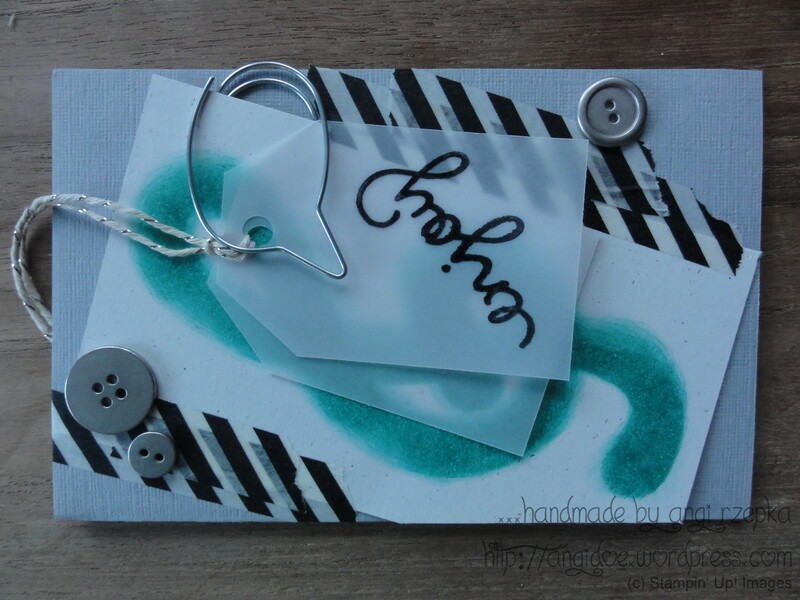 And as Bermuda Bay goes along so pretty with Smoky Slate, and Smoly Slate loves the metallic buttons and the metallic buttons love the black-striped Washi tape…well, one thing catched another and the card was already almost done. To soften the background a litte, I used the vellum for the tags and stamped the very famous „enjoy“ on top in StazOn Black. The paperclip actually is from IKEA, their new stationary section (wuhuu! ).